According to Roman mythology, Mars is the god of war. Mars also has particular significance in Hindu myths, where Mars is said to be the son of fire and described to be red and evergreen. That's what mythology has to say about Mars, our closest neighbour in the Solar System. People all over North America are looking at Mars without any telescope and any of the other metallic gadgets. You can also get the golden opportunity to view the red planet with the naked eye on 26th to 28th August with Bangladesh Astronomical Association at Wonderland in Gulshan-2. Time: 7:00 p.m. to 12:00 a.m. on 26th and 8:30 p.m. to 12:00 a.m. on the 28th. For further information contact Bangladesh Astronomical Association at 0171-187555. Dhaka's landscape seems to be taking a revolutionising change and the horizon of advertisement in the country seems to broaden. 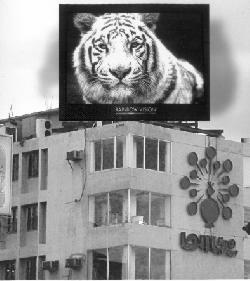 The introduction of LED [Light Emitting Diodes] display screens at the mouth of Manik Mia Avenue on top of Adel Plaza and the other on top of Ananda Cinema, seem to be changing the stereotyped billboards, neons and tri-vision screens. On the other hand Dhaka now has a way to have giant screen displays, where one can have Bangladesh test matches, concerts or the Victory Day Parade. In addition to all this, this can be used to display commercials of different companies, hence bringing in revenue. The screen on top of Aarong, begun trial display from the 5th of August and it will be launched in late August. and it will be launched in late August. Already 30 of the largest advertisers have put advertisements on the screen. IBBNET, who is responsible for the LED screens in stadiums, on buildings and other places all over the world is supporting Future Vision, the organisation of five youngsters-Quazi Moinul Islam, Saleh-Uz-Zaman Khan, Rakibur Rahman Chowdhury, Mushiur Rahman Khan and NK Sharafat Ali who are the ones setting the screen on top of Adel Plaza. Others who came forward with support include Simenco, AP Electronics and Aarong. This screen is best viewed from a distance of 30m. to 300m. Within an angle of 45, day or night makes no difference. The other one at Ananda Cinema is set up by Arkay Multimedia, a new enterprise of Arkay group. Minister for Information, Tariqul Islam inaugurated it. Japan's Panasonic develops the screen. A significant number of companies have already contacted them to get their product advertised on the screen which is resistant to sunlight and rain. Besides just putting up advertisement Arkay's Managing Director intends to put up different educational programmes relating to social concerns. The Vintage Room, Dhaka Sheraton Hotel's premier restaurant, has been Celebrating Seafood Promotions from August 10, 2003 and will continue until September 09, 2003. Experience the taste of food that has long been an essential part of the cuisine of many Atlantic, Scandinavian and Pacific countries. Savour the delicate yet distinctive flavours of this passionate yet nutritious gourmet's delight as their Chef prepares an array of delicious and succulent dishes that have now become so popular in Bangladesh! Try the Lobster Thermidor or the Salmon Steak for starters. To join the celebration, and enjoy a variety of these wonderful delicacies at dinner, please reserve you table by telephoning. The Vintage Room is open for diner from 7pm to 11pm nightly except Fridays. The website for Farzana Shakil's HAIR & BEAUTY, www.farzanashakil.com, has been launched online. Please visit her website for details on her latest make-up techniques and what is in and what is out in the world of make-up at her end. Home is a very strong instinct that shapes the borders of our personal and family spaces in distinctive ways. We choose to decorate our special places in ways that reflect our individual style and needs. This new collection from Jackie Corlett at MOTIF celebrates one of our own, most ancient yet familiar boundaries in a very unique way. Jackie gives us a head start with a wide variety of patterns and products to choose from in rich hues of old gold, regal reds and elegant greens. These wonderful colours and textured weaves in hand woven silks and cottons with luxurious embellished borders bring a touch of the time-honoured to our own most treasured spaces. Lengths of these beautiful fabrics are made into drapes, cushion covers and sold as yardage; whilst photo frames and various boxes add the essential detail - all at affordable prices. These rich fabrics have been developed with the skilled hand weavers of Tangail. The dextrous silk sari weavers so able to create beautiful borders, have put their traditions to stunning effect in this latest collection. The aim of MOTIF, Jackie's small business, is to promote the wealth of weaving traditions in Bangladesh. Here are some very colorful palov that are very tasty and never fails to click at parties. 1. Boil the Rice. Each Grain should be separate. 3. Heat the Ghee in a vessel & fry the Onions. 4. Add Spinach & Green Chillies & Fry for 2 minutes. 5. Add the Rice to the Spinach Fry & mix well. 6. Garnish with Cashew nuts & serve hot. The Spinach Rice is ready for 6 people. This is a very traditional & spicy rice variety of Karnataka (South India). Grind Gram Dal, Coconut, Cinnamon, Red Chillies & Coriander Seeds together into Masala Paste. Add the Dal, Rice and Vegetables with 2 TBL Spoon Oil in a Cooker and boil upto 3 whistles. Add to this the Masala Paste & Tamarind Water and boil for 2 minutes. Garnish with Curry leaves and Cashew nuts. The tasty & tangy Bisi Bele Bath is ready to serve 5-6 people. The YWCA teaches spoken English, which is conducted by experienced teachers. The package course is of 36 classes, that is 3 days a week for 2 hours, in total a course length of 72 hours. Though it is a spoken English course, a lot of reading and writing are done in order to learn the language well. Hence reading and writing skills are developed too. This institute is only for female students. There are courses for children from II to VIII also. This package is of 48 classes, every Friday and Saturday. They are taught not only how to speak English but also to read and to write. Lot of creative writing is done here to enhance their reading and writing skills. Creative writing, ethics, moral values and practical work are done too. The children are sometimes taken to the British Council as well. The courses are very effective and it surely develops an adult's mind as well as a child's. There are Spoken Bangla courses as well. There is the Modern Languages Institute in the Dhaka University where Spoken Bangla is taught by experienced teachers with classes taking place 3 days a week. A lot of foreigners come to learn Bangla. Bangla is a very tough language, but similar to what they do in the English courses, the teachers give emphasis on writing and reading skills in order to develop their speaking power. The students are taught with individual attention and lot of care. Emphasis is also given to hearing skills. It is a one-year certificate course. So, currently there are lots of organizations providing spoken English and Bangla courses in the city. Hence people looking to enhance their vocabulary skills in either form of medium do not have to look pretty hard. Foreigners, especially those working closely with Bengali employees, are anxious to get a grasp of Bangla, since it makes their job much easier. After all, a good worker is one who communicates best with his subordinates and counterparts. Hence, if your are still lacking your skills to speak Bangla or English just hurry and take the help of these institutes. Reference: Roxana. A. Chowdhury- Young Womens' Christian Association (YWCA) Rupa Chakraborty- Institute of Modern Language, University of Dhaka. Inaugurated on the 17th of August, the Italia Bar and Bistro is the new addition to the restaurants at the Dhaka Sheraton hotel. Previously known as the Sarobar, the poolside restaurant of the Dhaka Sheraton hotel, the outlet has changed its name and appearance and shall now serve Italian cuisine. The interior of the restaurant is marvelously done, and the design incorporates an open kitchen, emphasizing on the art of Italian cooking. Guests can enjoy Italian show cooking whilst waiting for their meal. The beautiful part of the restaurant is that it looks over the pool and this adds a different dimension to the décor of the restaurant. The Italia Bistro features traditional style windows for a great view of the pool. The outlet can cater for 70 people. The restaurant has a great ambience and the food is of great quality. Original Italian cuisine is rare in Dhaka and the Italian Bistro and Bar puts the spotlight on this sector. All the features of the restaurant make it unbelievably Italian, and this is definitely worth experiencing.